What are the differences between the many types of LASIK treatment? How can you know if you’re a good candidate for LASIK? And what is the likelihood of success? These are the questions LASIK candidates should ask while researching doctors for Lasik surgery. The fact is, not everyone is a good candidate for LASIK, and the only way to determine your candidacy is with a comprehensive evaluation. Doctors For Visual Freedom Laser Center offers complimentary LASIK consultations at their convenient John Hancock Center office at 875 North Michigan Ave. in Chicago. Candidates may schedule a complimentary evaluation by calling 312-291-9680 . Here are questions you should be asking the surgeon BEFORE you make any decision on LASIK treatment. 1. How long have you been performing LASIK? LASIK is one area of surgery where experience makes a huge difference. Considering the current wide range of experience among Laser Refractive Surgeons in the marketplace, it is important to find someone who has been performing LASIK treatments for at least five years. Surgeon Dr. Mark Golden is one of the pioneers in the field of LASIK surgery. He has trained hundreds of other surgeons in the techniques of LASIK and has opened more than a dozen laser centers around the United States. He has personally performed more than 23,000 laser procedures, including doctor referrals of patients with severe vision disorders or who have had complications from previous LASIK treatment. 2. How many LASIK procedures have you performed in total, and in the past year? Begin your search for someone who has performed at least 5000 procedures. If looking for strictly LASIK, and not PRK, be specific and have the surgeon exclude surface ablation PRK from his total. It’s wise to only consider surgeons who have performed at least 200 LASIK procedures in the past year. Dr. Golden has performed more than 400 LASIK procedures in the past year, not including any of his PRK or CK patients. 3. What percentage of LASIK candidates do you decline? Most surgeons will not have a specific number, but you want to know that your surgeon does not think that everyone is a good LASIK candidate. Some patients are better candidates for PRK and some should not have a laser refractive procedure at all. Dr. Golden begins every LASIK consultation by explaining that he only operates on perfect candidates. He wants every patient to be completely happy with their result not just early on, but years after. It is not unusual to find patients that aren’t good candidates, but this analysis should be made by the surgeon, not a source that may be concerned about losing income from the sale of glasses and contact lenses. 4. Will I receive Custom WaveFront laser technology? LASIK treatment can be provided using three different methods — custom, traditional or wave front optimized. Studies show that patients who receive the custom treatments typically have the best chance for great results — with less need for fine-tuning, fewer problems with night glare, and the opportunity to achieve vision superior to the best pair of glasses or contact lenses. Unlike many "discount" laser centers, Doctors for Visual Freedom offers only the latest and best Custom WaveFront technology. Their patients regularly experience the tremendous benefits of Custom WaveFront technology and achieve the best possible results. 5. What is the likelihood of needing an enhancement (a follow-up procedure) and what is your enhancement policy? In general, the higher the prescription, the greater the chance of needing enhancement or fine-tuning. Patients whose average prescriptions fall into the low to moderate astigmatism and myopia under -5.00 should expect an enhancement rate under ten percent. This is only a guideline; individual chances could be higher or lower. The surgeon should be able to fully explain their criteria for enhancements and the cost. There should not be a charge for enhancements, nor should there be a premium for life-time enhancements. It is extremely rare for the distance correction of someone to change years after the surgery if they receive treatment with modern Custom WaveFront laser technology. Those that charge a premium for "life-time guarantees" historically have commonly been out of business if something was needed. Unless someone wants Laser Vision Correction before their prescription is stable, this is usually a waste of money. The surgeon’s enhancement rate should not be excessively high or low. Enhancements are typically performed at about three months. At Doctors For Visual Freedom, enhancements are covered for a minimum of one year. In the rare situation where a woman becomes pregnant soon after surgery, the need for an enhancement is much greater than usual. Dr. Golden believes that it is best not to perform any form of Laser Vision Correction while a woman is pregnant or breast feeding. In such a situation, an enhancement would be performed whenever safety dictates. 99+% of our patients eventually achieve 20/20 vision or better. Dr. Golden will always discuss your risk of enhancement as a part of the regular preoperative examination. 6. Who will be performing my preoperative and postoperative care? The answer should be the surgeon. Unfortunately, too many laser centers bring a doctor in to perform surgery and optometrists or technicians perform preoperative and postoperative care. Minor difficulties can quickly become big problems when not handled properly. All good surgeons should insist on seeing their own postoperative patients. If being co-managed by another doctor for your convenience, make sure that your surgeon will be available to you at all times and for no additional fee. Some surgeons are not available to their surgical patients because they live out of town or work someplace else most of the time. Dr. Golden personally performs all preoperative and postoperative care. Their policy is to always have time to answer any and all of your questions at each visit in a relaxed environment. They pride ourselves in caring for patients one at a time (no assembly line service). Their practice is built on referrals because their patients are happy with their care. 7. Do I have any evidence of dry eyes and will you write me a prescription for Restasis? The process of making a LASIK flap causes virtually all patients to have dry eyes for at least the first three to four months. Those who already have marginal tear function or any signs of dryness should have it treated before surgery. Those with a significant dry eye condition may be better candidates for PRK Advanced Surface Ablation or no laser procedure at all. Studies show that individuals who use Restasis, enjoy better visual acuity than those who use only tear drops. Restasis increases your own natural tear production. Dr. Golden typically prescribes Restasis for all patients who comes in for a laser procedure, but it is only one of many possible treatments. Those who do not have insurance coverage for Restasis should know that there are options, and the doctor will discuss those with patients at the time of their evaluation. 8. What is the thickness of my cornea and how much cornea will be left after my LASIK procedure? Will you measure the thickness of my flap during surgery? The key to safe LASIK is to ensure that there is enough residual cornea left after the flap is made and the laser treatment occurs. There is no absolute consensus as to the amount of cornea to leave untouched. Most surgeons like to leave at least 300 microns at the base after the laser correction. Careful LASIK surgeons measure the thickness of the flap and look at the depth of proposed ablation and check to make sure that there is enough cornea left. The rule of thumb here is: The higher the correction in your glasses, the thicker your cornea needs to be for safety. Dr. Golden always measure flap thickness before and after surgery. The amount of cornea that is removed depends on the patient’s prescription, but if the cornea does not have the needed thickness the patient will not be considered a perfect candidate. He feels that it is extremely important that with an elective procedure such as LASIK, surgery should only be performed on perfect candidates and that includes enough corneal thickness. 9. Will you be using a microkeratome or a laser to make my flap? Originally, all LASIK flaps were made with a microkeratome (blade). Many of the most experienced LASIK surgeons around the world prefer this method because there is less energy involved in making the flap — allowing for faster healing and less inflammation. Recently, some practices have switched to a laser technique that produces thousands of small explosions next to each other, to create the flap. Those surgeons who have an investment in the laser for flap making feel that their technology is the best, and certainly in the hands of less experienced surgeons, the likelihood of flap complications is reduced. Ultimately, it does not matter whether your surgeon uses a laser or a microkeratome to make your flap as long as they have extensive experience with the technology that they are using. The key is to find the rate of flap complications your surgeon’s patients experience. Anything over 1% is very high, but commonly seen with the use of lasers for LASIK flaps. Dr. Golden prefers to use a microkeratome, although he has performed several thousand LASIK procedures using a femtolaser for flap creation. In an analysis of his patients, when compared with the microkeratome and the laser for flap making, he found that the microkeratome was faster, more comfortable for the patient, and provided faster return of visual acuity. 10. Is there any reason why I am at greater risk for complications than other patients? This question gives you and your doctor a chance to discuss your general medical history as it may affect your procedure or healing. You should also discuss the desire for pregnancy or recent significant hormonal changes as it affects you and your eyes. You should have a good understanding, after this question, as to the risks, benefits and alternatives to LASIK as they relate to your eyes specifically. You should also have received a thorough discussion of the procedure and postoperative care. Dr. Golden will always incorporate the patient’s medical history into his evaluation. He will then take all the time needed to discuss exactly what you should expect from your laser procedure including the risks and benefits for you, your eyes, and your life-style. Doctors For Visual Freedom believes that a thorough understanding of LASIK is essential before making an informed decision. They use videos, graphics, check lists of information and a complete LASIK packet to discuss all aspects of LASIK surgery. Dr. Golden will personally go over the risks, benefits and alternatives as they relate to you and your eyes. To schedule your complimentary comprehensive evaluation call 312-291-9680. To take the evaluation to find out if lasik is right for you, answer these questions. If you'd like to sign-up for special offers, register here. If you're planning to dine this Thanksgiving or if you want chefs to do the cooking for you to serve a gourmet meal at home, these two restaurants will accommodate. East Bank Club is hosting Thanksgiving dinner at its place this year and you’re invited. 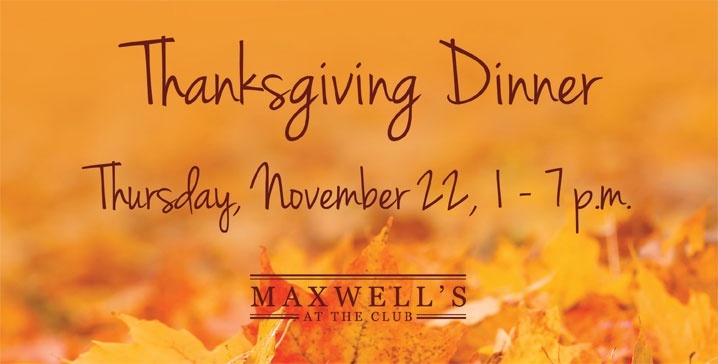 The East Bank Club’s signature restaurant, Maxwell’s at the Club (500 N. Kingsbury St., Chicago), is offering a traditional turkey dinner buffet with all the trimmings, 1 p.m. to 7 p.m., November 22. Executive chef Mike Lodes is featuring a variety of appetizer and salad choices including a mix of Chilled Shrimp, Roasted Fingerling Potato Salad, Pancetta and Gorgonzola Green Bean Salad, Cranberry Relish and more. A carving station in the room will feature Roast Turkey served with gravy and natural jus, Roast Prime Rib of Beef with horseradish sauce, and Roast Leg of Lamb with mint jelly. This dinner has an abundance of side options from Roasted Butternut Squash, Maple Roasted Sweet Potatoes, Cornbread Stuffing, to Roasted Fresh Seafood, Sautéed Brussels Sprouts, and Chicken Piccata. To finish off, guests will be treated to an impressive spread of seasonal fruits, assorted cakes, tortes, cookies, and cupcakes, as well as Pumpkin Pie and Southern Pecan Bars. The price is $45, and $12 for children 10 and under. Reservations can be placed online at maxwellsattheclub.com or by calling (312)527-5800 ext. 301. If you plan to entertain at home this Thanksgiving, East Bank’s Food Shop will be delighted to do the cooking. 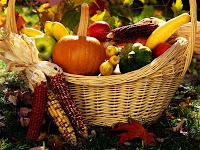 The Chefs at the Food Shop have put together a complete Thanksgiving menu to suit a variety of tastes. You have the choice of ordering a la carte from their entire menu or selecting the Thanksgiving Package. With the latter option the Food Shop chefs have curated their version of an ideal holiday meal. For $150 (serving 10), guests can enjoy a Whole Roasted Turkey, Mashed Potatoes and Cornbread Stuffing. There is also a choice of two from their list of side dishes: Sautéed Butternut Squash with Apples and Dried Cranberries, Sautéed Brussels Sprouts and Sautéed Green Beans with Wild Mushrooms. Dessert is also included with assorted mini muffins, pumpkin and apple pie. For the complete Thanksgiving menu visit eastbankclub.com, and to place your order call (312) 527-5800 ext. 318, no later than Friday November 16. Your order can be picked up by Wednesday November 21 to November 22. Prairie Grass Cafe (601 Skokie Blvd., Northbrook, IL 60062) continues its annual traditional turkey dinner ($47), 2:30 p.m. to 7 p.m. November 22. Chefs Sarah Stegner and George Bumbaris’ master touch creates a deliciously homespun dinner with all the trimmings. For starter courses guests can choose from a comforting bowl of Butternut Squash Soup or an Organic Mixed Green Salad with pumpkin seeds, parmesan, pomegranate and balsamic dressing. For the main event, Oven Roasted Turkey complete with mashed potatoes and homemade gravy will be served. This holiday dinner features the traditional sides of Apple Chestnut Stuffing, Sweet Potato Puree topped with homemade marshmallow. Fresh vegetables and cranberry sauce will also be available. An appropriately sweet ending to this Thanksgiving Day meal is a choice between Mom’s Pumpkin Pie, Pecan Pie, or Double Chocolate Cake. To place your reservation call (847) 205-4433. This Thanksgiving season, Prairie Grass Cafe wants to give you a night off and make dinner for you. With its Thanksgiving to-go menu, guests can enjoy the benefits of a delicious homemade meal, made by Chefs Sarah Stegner and George Bumbaris. This traditional turkey dinner has the benefit of being made with the fine dining cooking techniques and locally sourced ingredients Prairie Grass is known for. This catered dinner comes with multiple size options, and a variety of choices. All your favorites are available from Roasted Turkey with Gravy, with a choice between Apple Sage Stuffing or Homemade Sausage and Giblet Stuffing. The appetizers are a mix between Butternut Squash Soup, Jumbo Cocktail Shrimp with Homemade Horseradish Sauce and more. For side dish options, patrons can choose from Yukon Gold Mashed Potatoes, Sweet Potato Puree, Sautéed Green Beans, Cranberry Sauce and others. 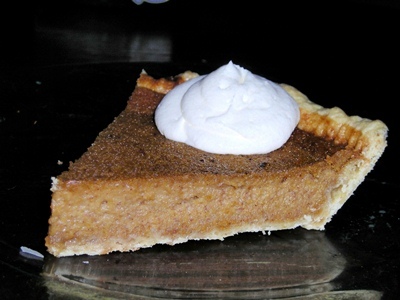 For dessert, Mom’s Pecan Pie, Pumpkin Pie and a Double Chocolate Cake are available. This ready-made dinner will be available for pickup, 12 p.m. to 3 p.m. November 22; orders must be received by November 18. To place your order call (847) 205-4433. Alimentari Osteria (621 W. Randolph St., 312-382-8880), the recently opened traditional Italian eatery in the West loop, is featuring a collection of its exceptional wines for its Special Wines of the Month list. To build on its namesake theme, Alimentari (Italian for marketplace) will showcase select bottles of its Italian and domestic varietals for purchase without a high-priced restaurant markup. This month, Alimentari features a robust selection of its reds, whites and sparkling wines. Two of the white wines featured are Corte Giara Chardonnay ($18) from the Veneto region, and a Kris Pinot Grigio ($19) from Alto Adige. For the red wine selection guests can enjoy a Decoy Merlot ($35) from Napa Valley, or a Tuscan Chianti ($21) from the wine makers Palladio. The sparkling wine selection is a Zardetto Private Cuvee Brut Prosecco ($18) from Italy. Westfield Old Orchard will once again host the Annual Harvest Festival. In partnership with the Wfamily event series, Westfield invites you to enjoy a weekend full of autumn activities suitable for the entire family. Entertainment will include arts and crafts, face painting, games and balloon sculptors. Later, children can celebrate Halloween early by participating in the annual costume contest and trick or treating at participating Westfield retailers. The annual Harvest Festival will take place noon – 4 p.m., October 27 and 28 at the north end of the shopping center near the Koi Pond. This event is free and open to the public, no reservations are required. The Chicago French Market will be hosting its annual salute to Halloween with The Great Pumpkin Party. Bring the children to Chicago French Market 10-12:30 p.m Saturday October 27 for the festivities. The day will begin with pumpkin decorating for the kids followed by a market- wide costume parade. Afterwards, “Best Costume” awards will be given to youngsters in a contest that will be judged by age group. To end the morning’s Halloween activities, there will be market-wide trick or treating. The Great Pumpkin Party is being sponsored by Chicago French Market, Fulton River District Association and Concentra. Project Pink, a 5k non-competitive walk, will be taking over the shopping center beginning 9 a.m. Sunday, October 21 for National Breast Cancer Awareness month. Westfield’s Project Pink is one of more than 250 nationwide events that aim to show support for the American Cancer Society’s Making Strides Against Breast Cancer. It’s an energetic special occasion designed to express hope and celebrate Breast Cancer survivorship. Additionally, Project Pink will focus on raising awareness about steps women can take to help prevent the disease and raise money to find cures. The walk will commence and end in the West parking lot across from Macy’s and continue in and around the center. See schedule of event below. Participating Westfield retailers will feature special pink merchandise and donate proceeds from sales to breast cancer awareness. There is no registration or fundraising requirement for Making Strides, however participants are welcome to raise money online or collect donations to turn in on the day of the event. For more information and to sign up for Project Pink visit www.makingstrides.acsevents.org. The result of their vision is Alimentari, a casual Italian osteria with a sleek contemporary attitude and a conversational vibe. 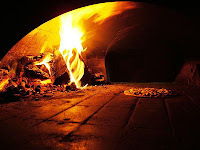 It is a modern, farm-to-table Italian restaurant and gathering spot featuring casual Italian cuisine in which everything is prepared in-house from fresh, all-natural ingredients. The culinary finesse of Chefs Bonhomme and Casa is ever-present: the food is casual, yet the refinement and balance of flavors that were their calling card at Pane Caldo are still on display. 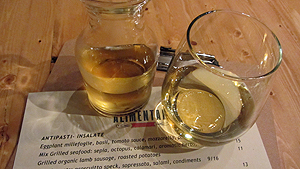 Alimentari’s food is a delightful coupling of tradition and modernity. While many dishes accede to today’s penchant for lighter, healthier recipes, there are signature dishes, such as the perfectly prepared risotti and pastas, which are hearty enough to satisfy aficionados who seek out authentic Italian fare for its comforting robustness. The contemporary interior design is intended to be easy-going and stylish in keeping with the hip, laid-back character of the neighborhood. The room features warm, light-toned woods with burgundy colored decorative accents. The sleek butcher-block teakwood tables are solid and the wooden studio chairs and stools are very comfortable. The large bar area is as appropriate for dining as it is for enjoying selections from the well-conceived, mainly Italian wine list. In the front, there is a cozy semi-private dining nook that is excellent for groups of 8-16 people. Alimentari is also attracting the after-work crowd with a special weekday wine tasting. Beginning at 5 p.m. at the bar, guests can enjoy a sampling of Alimentari’s Italian wines ($15) paired with a selection of complimentary “benvenuti antipasti” and pizzetti. 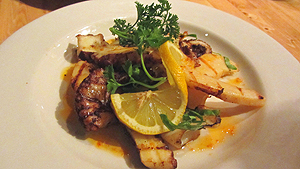 Alimentari offers many pleasant surprises each day. 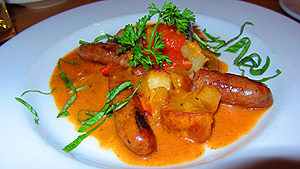 In addition to the regular menu, Chefs Bonhomme and Casas showcase several daily specials. Their repertoire is extensive and the daily specials give the chefs the opportunity to showcase either traditional or modern interpretations of Italian dishes, depending on the available ingredients and their mood for the day. For dinner, the journey begins with a varied selection of fresh antipasti. Many guests start their meal by sharing a Cured Meat Board with proscuitto speck, sopressata, salami, cornichons, mustard ($9 small/$16 large), or indulging in the generous Mix Grilled Seafood with sepia, octopus, calamari, aromatic herbs, garlic, chili, lemon ($15). Other delicious antipasti choices include the Eggplant Millefoglie, basil, tomato sauce, mozzarella, parmesan ($9), the Grilled Organic Lamb Sausage, roasted potatoes ($11), Buratta Cheese, roasted red peppers, arugula ($13), Roasted beets, ricotta, arugula, balsamic, extra virgin olive oil ($11), the Caprese, fresh mozzarella, seedless eggplant, basil, balsamic, extra virgin olive oil ($12), and Grilled Fresh Vegetables, extra virgin olive oil, balsamic ($10). Farm-fresh Insalate options include the popular Grape Tomato Salad, fresh mozzarella, seedless eggplant, basil, balsamic, extra virgin olive oil ($12), the Roasted Beets, ricotta, arugula, balsamic, extra virgin olive oil ($11) and Baby Spinach Salad, goat cheese, watermelon, tarragon dressing ($8). 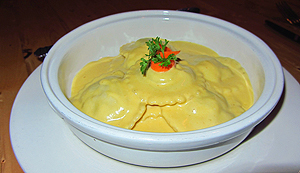 The Pizzetti are a light and tasty embellishment to a meal. These small, individually sized pizzas feature a thin, crispy crust and a variety of fresh toppings. The Burrata pizette features creamy mozzarella, grape tomatoes, basil ($7); diners can add Proscuitto di Parma for an additional $2. The gluten-free Farinata pizza is topped with wild mushrooms, fontina, truffle oil, and pine nuts ($7). Alimentari’s made-in-house Pasta dishes are wonderful illustrations of the self-assurance and skill that Chefs Bonhomme and Casa bring to the kitchen. The biggest crowd-pleasers during the fall are the homemade Tortelloni filled with butternut squash, ricotta, zucchini sauce ($16). Other zesty pasta selections for the fall include Ravioli, shrimp, avocado, saffron-fennel sauce ($18); Tagliatelle, pork and beef Bolognese ($17); Penne Arrabiata, fresh mozzarella, fine herbs, spicy tomato sauce ($14); Linguini, ragu of grouper, light spicy tomato sauce ($21). The Risotto, with fresh wild mushrooms, wild herbs, and parmesan ($19) is hearty, perfectly prepared and easily shared. The Carne-Pesce entrées are prepared with finesse and a nod toward great traditional Italian fare. Meat lovers will enjoy the Braised Beef Short Ribs, 12 years old Aceto balsamico ($25) and the Grilled New Zealand baby lamb chops, garlic mustard-rosemary sauce reduction ($28). 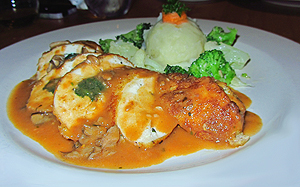 There is a daily fish special—Pesce Del Giorno (market price)—and the chicken entrée, Roasted organic layers of chicken, spinach, prosciutto, mozzarella, mushroom sauce ($22) is juicy and satisfying.The sumptuous made-in-house Dolci are expertly prepared. Chocolate lovers will enjoy the Chocolate Cake, Brownie, raspberry sauce ($8), and the Tiramisu with chocolate mousse ($8). The Pear Almond Tart/Apple Tart, caramel sauce ($8) and the Panna Cotta, raspberry sauce ($7) are also exquisite, somewhat lighter, choices. Diners can also top off their meal with a selection of homemade gelati or a cheese plate. The sizeable wine list features primarily Italian wines. Many are available by the glass or quartino (small carafe). The serving staff is knowledgeable and eager to help guests choose a perfect wine selection. The beverage program also features a selection of microbrews and a full range of cocktails. 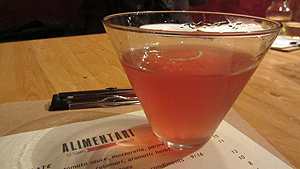 Alimentari Osteria is located at 621 W. Randolph Street in Chicago’s West Loop. Dinner is served from 5 p.m. to 10 p.m. Monday through Thursday; 5 p.m. to 11 p.m. Friday and Saturday. All major cards accepted; valet parking is available. For more information about Alimentari Osteria, please visit the website, www.alimentariosteria.com or call (312) 382-8880. Prairie Grass Cafe (601 Skokie Blvd., Northbrook, IL 60062; 847-205-4433) will be hosting the Yalumba Wine Dinner 6:30 p.m. Thursday October 11. The sumptuous dinner, presented by Schaefer’s, welcomes guest Louisa Rose, Chief Winemaker at Yalumba Winery. The cost is $85 per person, all inclusive. Reservations are required; please call Schaefer’s at 847-677-9463 to make reservations. Prairie Grass Cafe chef and co-owner, Sarah Stegner attributes much of her success to her philosophy of using fine dining cooking techniques to produce approachable, casual food. Quality ingredients are most important as evident in her efforts in co-founding Green City Market and supporting local sustainable farms. Sarah brings that philosophy to Prairie Grass Cafe and along with chef and co-owner, George Bumbaris, has prepared a four course dinner menu presented with pairings from Yalumba Winery. The appetizer course will be served family-style and offer guests Pizza with Italian Sausage, grilled onions, peppers and mozzarella cheese, Baked Feta Cheese with spicy banana peppers and tomatoes and Crab Cake with grapefruit avocado and cucumber salad with citrus butter paired with Pewsey Vale Riesling 2011. The next course will feature Mixed Greens with seasonal vegetables and shaved parmesan with balsamic vinaigrette paired with Hill Smith Estate Chardonnay 2010. For the main course, diners will have the choice of three options: Parmesan Crusted Tilapia with creamed spinach, Ancho Marinated Skirt Steak served over mushroom ragout with caramelized onions or Crispy Half Boneless Chicken served with mashed potatoes and warm pesto green bean salad. Wine pairings will feature a choice of Yalumba “Patchwork” Shiraz 2008 or Yalumba “The Signature” Cabernet Sauvignon/Shiraz 2006. Finally, the dessert course will offer Warm Chocolate “Muk Muk” Cake with vanilla bean Creme Anglaise. Dessert will be paired with Yalumba Museum Reserve Antique Tawny Port, coffee and tea also will be served. Louisa Rose stepped into the role of Chief Winemaker at Yalumba in 2006, taking over responsibility for all the wines of the Barossa-based Hill Smith family. In October 2008, Louisa was named “Winemaker of the Year” by the prestigious Gourmet Traveller WINE Magazine. Yalumba was founded in 1849 by Samuel Smith, British migrant and English brewer, who had brought his family to Angaston seeking a new life. After purchasing a 30-acre parcel of land just beyond the southern-eastern boundary of Angaston, Smith and his son began planting the first vines by moonlight. Samuel named his patch "Yalumba" – aboriginal for "all the land around." Five generations and 160 years later Yalumba, Australia's oldest family owned winery, has grown in size and stature, embodying all that has made the Australian wine success story the envy of winemakers the world over. 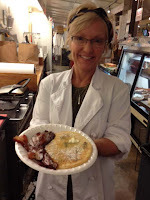 Prairie Grass Cafe (601 Skokie Blvd. ; Northbrook, IL. ; 847-205-4433) supports Chicago’s Green City Market and local sustainable farms, selecting the freshest ingredients to reflect the season. Prairie Grass Cafe currently serves lunch Monday - Friday 11 a.m. to 2 p.m.; and dinner Monday - Sunday; Tuesday - Thursday 5 p.m. to 9:30 p.m., Friday and Saturday 5 p.m. to 10:30 p.m., and Monday and Sunday 5 p.m. to 9 p.m. Prairie Grass Cafe also serves brunch Saturdays 10 a.m. to 2 p.m. and Sundays 9:30 p.m. to 2 p.m. Light fare is available in the bar Monday through Friday 2 p.m. to 5 p.m. For more information or to make a reservation, please call (847) 205-4433 or visit www.prairiegrasscafe.com. Maxwell’s at the Club’s (500 N. Kingsbury St.) popular Sunday Brunch is returning, beginning 10 a.m. to 2 p.m. October 7. The brunch menu includes a variety of choices from a full omelet bar, freshly made waffles, to herb-roasted salmon, salads, seasonal fruit and more. You also can indulge in sour cream pancakes, eggs Benedict, pecan French toast, carved roast beef, and sliced nova lox with toasted bagels. Brunch is $28 for adults, $12 for children 7-10 years old, and $6 for kids 4-6 years old. Brunch is complimentary for those under 3 years old. There is no need to be a member of East Bank Club to take advantage of the lavish Sunday Brunch at Maxwell’s, as always the restaurant is open to the public. To ensure availability make a reservation at (312) 527-5800 ext. 301. 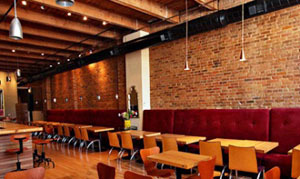 Maxwell’s at the Club is the sophisticated yet casual restaurant at East Bank Club. 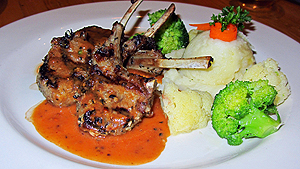 The menu offers a broad selection of delicious small plates, salads, entrées, desserts and wines. Maxwell’s is located just off of East Bank Club’s main lobby, and is open to the public. Lunch at Maxwell’s has returned beginning October 1. The restaurant’s fall hours are, 11:30 a.m. to 9:30 p.m. Monday through Friday. Sunday hours are 10 a.m. to 2 p.m.
Italian Night is back at Maxwell’s at the Club (500 N. Kingsbury St.) starting, 5:30 p.m. to 9:30 p.m. October 5. Take advantage of the extensive buffet options available every Friday evening. From antipasto Caesar and Caprese salads, to entrées of grilled Flank Iron steak, and Norwegian salmon, there’s something for every taste. Also, try your favorite blend of pasta at the build-your-own pasta station, where the chef will be sautéing a range of sauces, pastas and add-on ingredients, as you like. To finish off, the dinner includes the dessert options of sorbet, chocolate amaretto tart, and gelato. Enjoy the sounds of the Joe Hurt Trio while you dine. Maxwell’s Italian Night costs $28 for adults and $12 for children 10 and under. Make a reservation at (312) 527-5800 ext. 301. October 6 is National Star Wars Reads Day and Westfield Old Orchard (Skokie Blvd. & Old Orchard Rd. ; 847-673-6800) is gearing up to celebrate it Wfamily style. The monthly series continues 11:30 a.m. to 12:30 p.m. Saturday, October 6 at Westfield’s Barnes & Noble, where the iconic movie trilogy will be celebrated with North Shore and Chicagoland families. Kids will enjoy a story time followed by event activities such as coloring, Star Wars Mad Libs and card making. Participating kids will receive themed prizes to take home including stickers, tattoos, bookmarks and pins. Oh, Olive! is inviting chefs of all skill levels to submit an original recipe for its Rev-OIL-utionary recipe challenge. Using its Delizia olive oil plus two other Oh, Olive! items as key ingredients, contests are challenged to submit a sweet or savory creation for a chance to win the opportunity to be featured in the next Oh,Olive! Favorites cookbook; earn recognition by well-known Chicago and National food professionals; have their winning recipe served at a notable Chicago restaurant and take home a $150 gift basket full of Oh, Olive! products. As a thank-you for participated, each contestant will receive a free 60 milliliter bottle of olive oil. Judging for a winner and runner up will be food notables Chef/Owners Matt Eversman OON Chicago and Randy Zweiban, Province, Tom Mueller, author of Extra Virginity: The Sublime and Scandalous World of Olive Oil and James Beard Nominated Chicago Food Journalist and Former Food Editor of the Chicago Sun-Times, Janet Fuller. Entries are being accepted October 20 through November 20. Entries can be submitted to Chicago French Market Oh,Olive location or emailed to sandy@ootogo.com. Oh, Olive is offering another wonderful seasonal recipe for the do-it-yourself crowd. 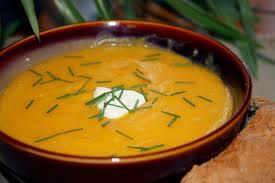 Give this recipe for Butternut Squash soup a try! Cut squash into 1-inch chunks. In large pot add butter oil, onion, and cook until translucent, about 8 minutes. Add squash and stock. Bring to a simmer and cook until squash is tender, about 15 to 20 minutes. Remove squash chunks with slotted spoon and place in a blender and puree. Return blended squash to pot. Stir and season with Maple Balsamic, nutmeg, salt, and pepper. Before serving, drizzle a fine line squiggle of the Wild Mushroom & Sage oil across the top. Serve. It’s still not too late to sign up for Oh, Olive’s veggie medley cooking class from 6 p.m. -7 p.m. October 7. Learn how to pair some of your favorite harvest vegetables with olive oils and balsamic vinegars to turn those ordinary veggies into a spectacular meal. Call the Chicago French Market at (312) 207-1795, sign up in person or register online at www.ootogo.com for the Veggie Medley Cooking Class. The cost is $20 per person, prepaid by phone or in person. Classes are reserved for the first 25 paid applicants. Maxwell’s at the Club (500 N. Kingsbury St.) welcomes you to indulge in their Baby Back Ribs Night, 5:30 p.m. to 9:30 p.m. Thursdays. At Maxwell’s you can treat yourself to a pound and a half full slab of tender baby back ribs, served with corn on the cob, smashed potatoes, and coleslaw. The dinner is $16, and available to the public. For reservations call (312) 527-5800 ext. 301. 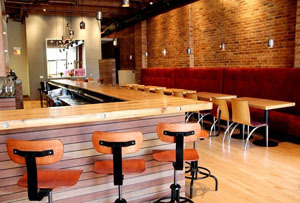 Maxwell’s at the Club is the sophisticated yet casual restaurant at East Bank Club. The menu offers a broad selection of delicious small plates, salads, entrées, desserts and wines. Maxwell’s is located just off of East Bank Club’s main lobby, and is open to the public. Lunch at Maxwell’s has returned beginning October 1. The restaurant’s fall hours are, 11:30 a.m. to 9:30 p.m. Monday through Friday. 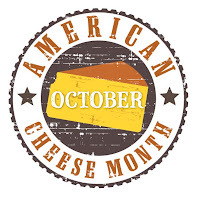 Sunday hours are 10 a.m. to 2 p.m .
October is American Cheese Month at Pastoral Artisan Cheese, Bread & Wine. Fifteen percent of select sales from featured American Cheese items will be donated in the name of Daphne Zepos to the American Cheese Education Foundation. Daphne Zepos was an internationally recognized expert cheese educator, making significant contributions to the American Cheese Industry. She was responsible for sourcing traditional artisan cheeses direct from European farms and teaching people how best to enjoy them. She was a great mentor to Pastoral and can be credited to helping elevate the way in which it speaks about its products. Pastoral will be featuring the Great Ladies of Cheese Gift Medley available for $49.99. Fifteen percent of sales will be donated to the American Cheese Education Foundation. This gift box honors female cheese makers who have made their mark on the cheese world. Items featured include Evalon from LaClare Family Farm in Wisconsin, Picolo from Andante Dairy in California, Grayson from Meadow Creek Dairy in Virginia and small batch preserves from The Gracious Gourmet in Connecticut. The gift box can be purchased in the store or online at www.shop.pastoralartisan.com. A special October Sandwich for Pastoral Artisan Cheese, Bread & Wine will be crafted by Chef Chrissy Camba, of Bar Pastoral. Chef Chrissy will create a unique cheese-centric sandwich that will be available during the month of October. Fifteen percent of sandwich sales will go to America Cheese Education Foundation. Check with Chicago French Market Pastoral location for details. 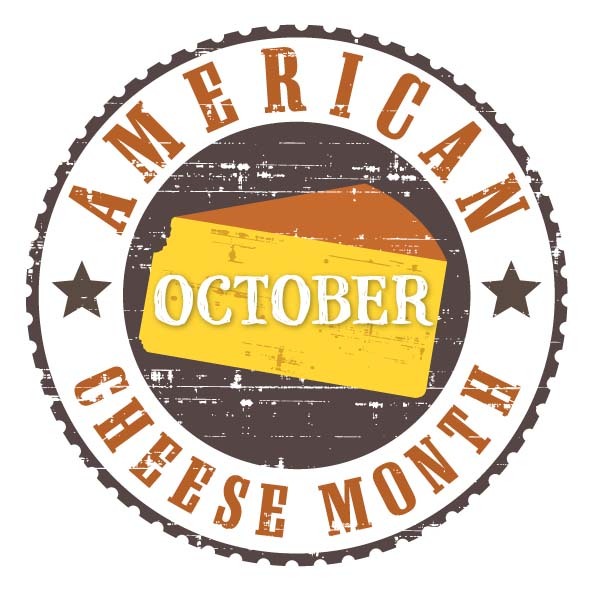 Every week in October, Pastoral will be featuring different American artisanal cheeses thoughtfully paired with American wines, beer, spirits or other accompaniments. 15% of all sales from these items will go to American Cheese Educations Foundation. Check Pastoral’s website or visit the Chicago French Market location to see what weekly cheeses and wines will be highlighted. Finally this month, Pastoral Artisan Cheese, Bread & Wine is celebrating the seasonal release of Rush Creek Reserve, America’s most sought after cheese. Pick some up for $25.99 at the Chicago French Market location. Maxwell’s at the Club (500 N. Kingsbury St.) is thrilled to bring you the Small Plates dinner, every Wednesday. Starting at $24, you can savor the rich flavors represented on the Small Plates menu; including seared ahi tuna, oysters on the half shell, chicken skewers, petite filet mignon, stuffed baby portabellos and more. This special dinner will be complimented by the guitar styling of Gypsy Influence. The Small Plates menu changes weekly for more information visit eastbankclub.com or call (312) 527-5800, extension 301. Westfield Old Orchard will once again celebrate the imminent arrival of fall with the Annual Harvest Festival. In partnership with the Wfamily event series, Westfield invites you to enjoy a weekend full of autumn activities the entire family can enjoy. Family-friendly entertainment will include arts and crafts, face painting, games and balloon sculptors. Later, children can celebrate Halloween early by participating in the annual costume contest and trick or treating at participating retailers. Celebrate the season from noon – 4 p.m., October 27 and 28 at the north end of the shopping center near the Koi Pond. Westfield’s Annual Harvest Festival is free and open to the public, no reservations are required. 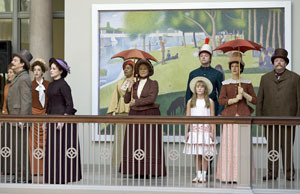 When the Chicago Shakespeare Theater put together the artistic game plan for its soon-to-open production of the Sondheim and Lapine musical “Sunday in the Park with George,” CST’s creative agency, Leo Burnett/Arc Worldwide, placed a call to Chicago-based digital retouching artist Michael Lande. 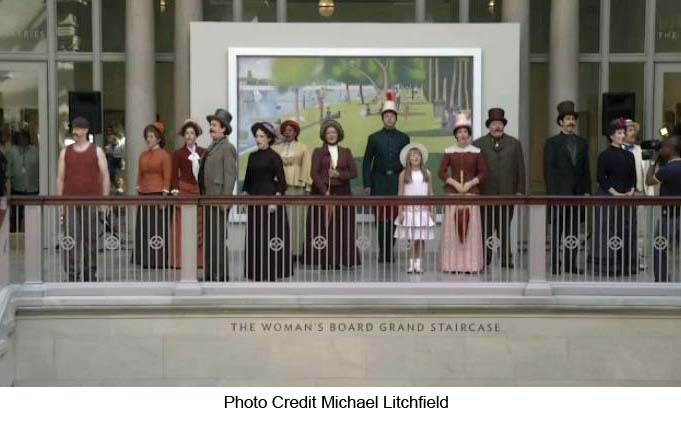 The mission was intriguing: To create a unique, life-sized rendering of Georges Seurat’s famous “Sunday Afternoon on La Grande Jatte” painting. This is one of the Art Institute of Chicago’s most prized and beloved masterpieces. For Lande, conceiving and producing this work of art was an adventure that captured his imagination—and tested the enormous skill set he has developed over twenty years of working in the digital space. He was a natural choice for this project. He has built a stellar reputation for his longtime work with such major clients as Leo Burnett, P&G, McDonald’s, Coca Cola, Comcast, Miller, Nintendo and Wrigley’s, to name a few. 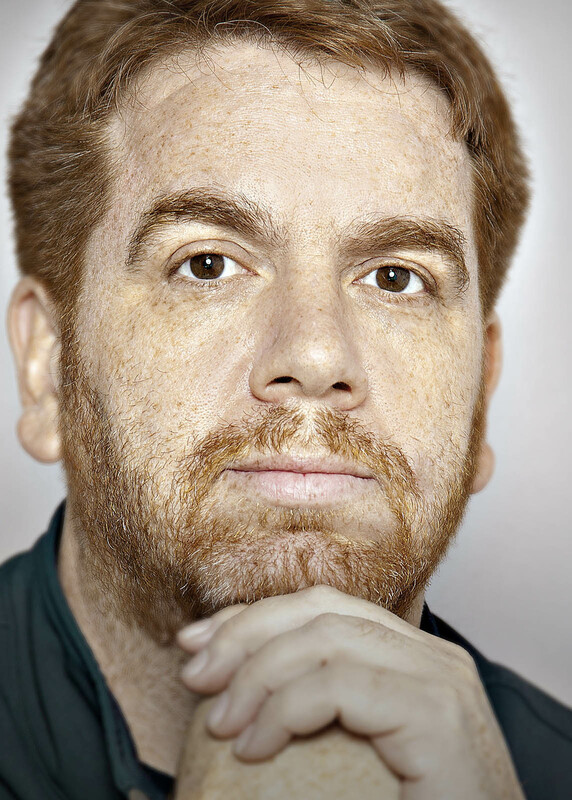 He is a CLIO award winner and a go-to artist for many projects involving photography, retouching and special effects. Lande started with a quarter-scale digital version of the original painting. He then enlarged it to life-size and digitally removed and replaced parts of the digital image to accomplish his mission. 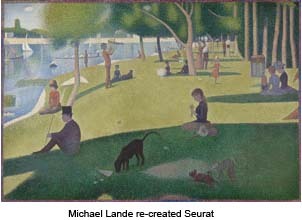 Using a Wacom Intuos 5™ pressure sensitive tablet and stylus, which allowed Lande to work as if he was holding a paint brush, he experimented with a variety of digital techniques to achieve the Seurat look. 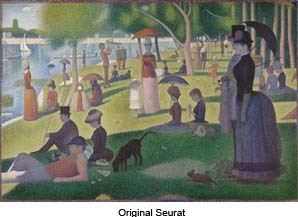 “I tried using the clone stamp tool and patch tool, among a variety of techniques, but I finally wound up painting by blocking in colors and then painting dot by dot, the same way Seurat did, using the new mixer brush tool that is available in Adobe Photoshop CS6™,” he said. The rendering was on display at the Art Institute of Chicago during a preview event for the Chicago Shakespeare Theater and from there, it was moved to Chicago’s Navy Pier Expo. On September 26 it will be on display in the lobby of the Shakespeare Courtyard Theater at Navy Pier, where it can be viewed during the run of “Sunday in the Park with George” which ends on November 4. After the final performance, the artwork will be auctioned off to benefit Chicago Shakespeare's arts-in-education programs. For more information about the September 26-November 4 production of the Chicago Shakespeare Theater’s “Sunday in the Park with George,” please visit the CST website at www.chicagoshakes.com or call the theater box office at (312) 595-5600. To contact digital photographic artist Michael Lande, please visit his website at www.landepictures.com. He can be reached by telephone at (312) 404-1593 or by email at michael@landepictures.com. Fumare has expanded its breakfast menu to offer seasonal fruit pancakes, homemade waffles and Pastrami-infused hash browns in addition to its widely popular egg sandwiches. 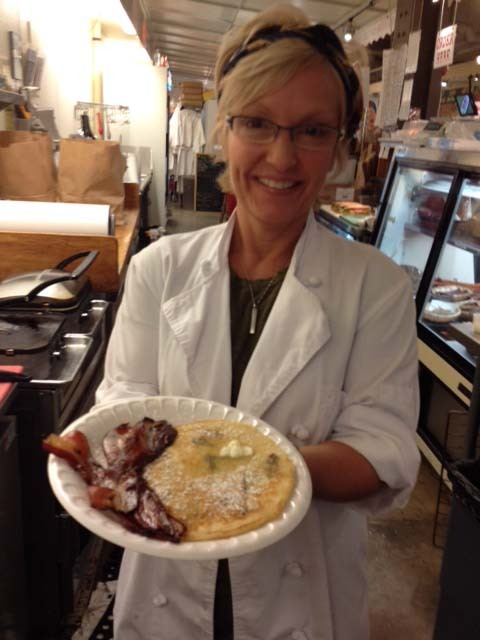 Owners Richard and Joan McCracken ensure the use of the freshest ingredients for the hearty new breakfast options. Don’t forget about the bagels and cream cheese which also are still available; and what’s a bagel without fresh lox? Breakfast is available starting at 7:30 a.m. Monday through Friday. This October, Lavazza Espression will be celebrating fall flavors by featuring some new seasonal menu items. An artisan crafted cardamom mousse layered over a light flourless chocolate cake. Now available for $3.95. An artisan crafted pumpkin mousse layered over a gingersnap cookie crust, crowned with crystallized ginger. Now available for $3.95.